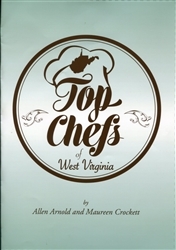 Open Top Chefs of West Virginia to any page and you will see immediately that the array of recipes and cooking styles represented in this book is amazingly diverse. The reason is quite simple—it includes the creative talent of twenty of West Virginia's finest chefs. Top Chefs of West Virginia's variety reflects the far ranging experiences and global culinary traditions that inspire the work of the individual contributing chefs. But its origins are the Appalachian ingredients and flavors of West Virginia, and this marriage gives it an interesting, in point of fact, a unique twist. It becomes a "New Appalachian" cuisine. The recipes in Top Chefs of West Virginia exhibit another aspect of variety. They range in complexity and time requirements providing you flexibility in the kitchen. Some need no extensive preparation time and can be prepared for your family as an evening meal. Others may be reserved for a Sunday dinner, or one shared with friends or family to celebrate a special occasion. In either case, they will all get a "wow" response from everyone at your table. These recipes were developed by West Virginia chefs as the buy local farm products movement was expanding across the country, and they share common emphases—the importance of sustainable agriculture, healthy eating, and knowing where your food came from and how it was raised.